ALL-NEW ARC! ALL-NEW JUMPING-ON POINT! 'BARBARIANS' - PART ONE! As HARBINGER WARS 2 besieges the Valiant Universe - and X-O Manowar along with it - Aric of Dacia cannot escape the flames that now threaten his future?or the shadows that cloud his past. Before space? Before the armor? Return to the apex of the Visigoth conquest as a younger, brasher Aric and a sword-wielding grifter set off on a continent-spanning quest for fortune, glory, and power! From the bloodstained sands of the gladiatorial arena to the dunes of the Arabian Desert, meet the man who would become the warrior-king of an alien civilization - and our own world's most powerful hero - as he sets out to seize his destiny once upon a time in a land of faraway kings and unrepentant conquerors! 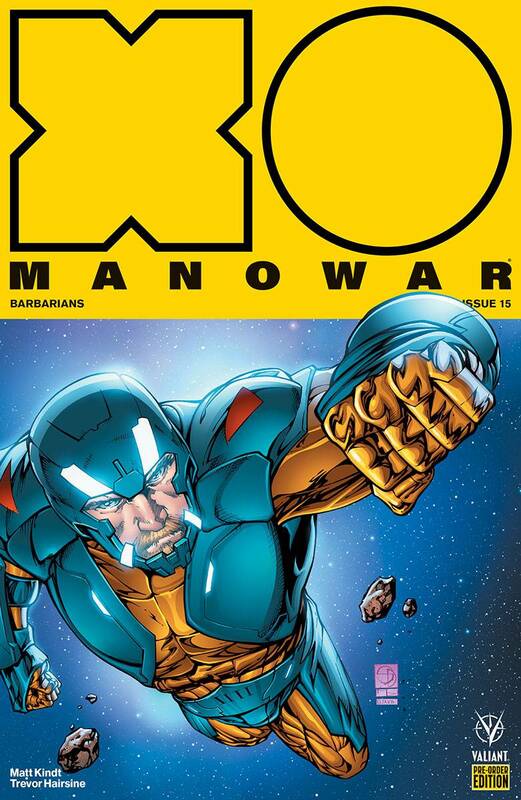 Jump on board one of the most acclaimed series in comics here as visionary creators Matt Kindt and Trevor Hairsine - the best-selling team behind DIVINITY - reunite for a thrilling, four-part melee of blood and steely-eyed daring at the height of the barbarian age with a brutal new chapter in the epic saga of X-O Manowar!